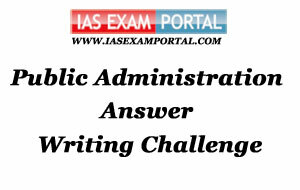 Weekly Mains Exam 2016 Answer Writing Challenge - Public Administration "MODULE- 25" | IAS EXAM PORTAL - India's Largest Community for UPSC Exam Aspirants. Weekly Mains Exam 2016 Answer Writing Challenge - Public Administration "MODULE- 25"
Public Administration- Paper I "Syllabus Topic – Administrative Thought"
Indian Administration- Paper II "Syllabus Topic –Plans and Priorities"
Q2. Despite the adoption of decentralised planning, participatory initiative remain marginalised and divisive live in many regions. Discuss 20 Marks.